A softer result across the board this week for all categories in all three centres as buyers take advantage of increased VM to discount heavily. The EMI dipping back under 1500¢/kg clean after shedding 27¢, although out West price falls were of a lesser magnitude and the WMI managed to hold above 1500¢, closing 15¢ softer on the week to 1520¢/kg clean. Largest magnitude falls were noted for the finer microns with price decreases between 50-100¢ noted. 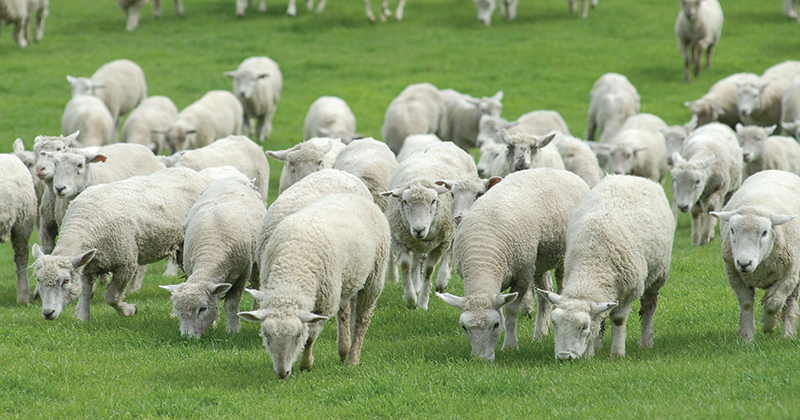 Medium fibres posting declines in the 10-40¢ range, while crossbred fleece just 5-10¢ softer. Southern 28-micron and Cardings in all centres the only categories to record slight gains. Growers responding to the falling prices by lifting pass in rates, particularly in Fremantle where 23.1% was passed in. Nationally 29,091 bales were sold, out of a possible 34,270, resulting in a pass in rate of 15.1% and suggesting that growers are comfortable to bide their time for better prices. The general view among growers appears to be that supply is tight and mills don’t have much stock in the pipeline so there seems to be a reluctance to chase a falling market. Clearly, in the short term the volume of bales on offer are expected to contract further. However, over the longer term an eye needs to be kept on the trend in demand, as the risk is always there that overseas buyers adjust down their purchasing requirements to reflect the anticipated lower supply. Next week will see all three centres in operation on Wednesday and Thursday with just over 30,000 bales rostered for sale. 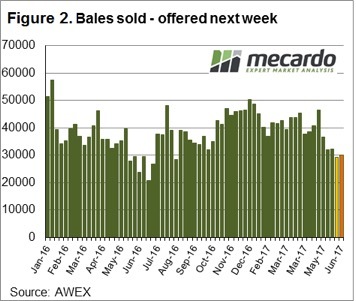 The week following bales on offer are expected to be the lowest scheduled so far this season at 25,820 (potentially a clue to why growers are comfortable riding out the price decline).